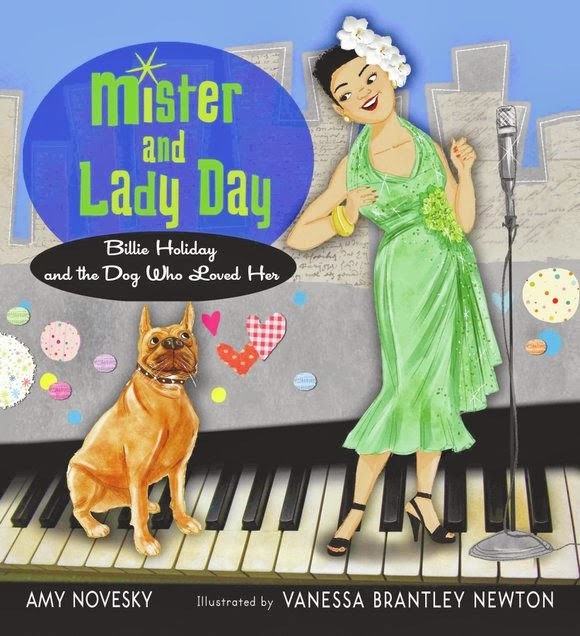 Amy Novesky's most recent picture book, Mister and Lady Day, an ode to jazz great Billie Holiday and her pet dogs, just arrived at my library in time for Women's History Month. This is Amy's fourth book on prominent female figures in cultural history; she has also penned Me, Frida (on artist Frida Khalo), Georgia in Hawaii (on artist Georgia O'Keefe), Imogen (on photographer Imogen Cunningham). She is currently working on a picture book on sculptor Louise Bourgeois. Billie Holiday's tragic life. which included working as a prostitute, living in a workhouse with her mother, drug addiction, a prison sentence, and more, might not seem like a natural fit for a picture book for young children, and indeed, this side of Holiday's life does not appear in Novesky's book. Novesky focused instead on Holiday's love for her many dogs, and in particular for her boxer named Mister. Love for a dog, of course, is a theme that children identify easily with, as do many adults (OK, I'm a sucker for a good dog story). We first meet Billie Holiday as a young girl, dreaming of being a star, singing on a borrowed gramophone. Illustrator Vanessa Brantley Newton, whose charming illustrations are done with gouache and charcoal with collage elements, depicts Billie in a beautiful setting on a fancy chair, dressed up with a bow in her hair (perhaps a bit fanciful given the realities of her childhood!). The next spread shows her already a star, the great Lady Day. (Illustrated 2-page spreads from the book can be seen on Novesky's website). Novesky introduces a note of melancholy in the text from the beginning, by explaining that even stars need someone to listen to them, and that's the role Lady Day's dogs played. We meet her small dogs, chihuahuas Pepe and Chiquita, her big dogs (a Great Dane named Gypsy, and finally her favorite dog of all, Mister, who we see in a fabulous illustration, walking with Billie on a leash wearing matching mink coats. Instead of a sidewalk, they are walking on a piano keyboard, with the buildings of New York in the background. Mister had the life of a star himself; he was so pampered he got to eat steak while she was performing in glamorous clubs, and he waited for her while she performed, even serving to keep eager fans at bay. Novesky tells young readers that "Lady got into trouble. She had to leave home for a year and a day. And Mister couldn't come." In an afterword, she explains that Billie Holiday was in fact in jail during that time for drug possession. When she returned, Mister was there to welcome her, and even accompanied her to a grand concert at New York's Carnegie Hall. The story ends on a hopeful note, with Billie singing her heart out, and Mister listening in the wings. An author's note gives some more background on Holiday's life, appropriately omitting some of the uglier facts, and provides additional sources and a web resource. There's no CD with the book, but readers could easily find CD's of Holiday's unique singing style at the library or on YouTube, which would enrich the story. This is a moving yet charming book about a difficult subject, and could be integrated into units on Black History Month, Women's History Month, or jazz. I am currently working as a children's librarian in the Los Angeles metropolitan area. For more on my background, click on my photo to go to my About Me page. 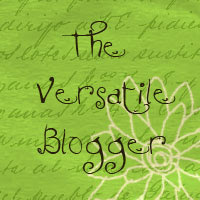 You can reach me by commenting on this blog or by e-mail at margo_tanenbaum@yahoo.com. If you would like to send me a galley, please contact me for my mailing address. Some of the books reviewed were received as advance review copies from Amazon Vine or directly from the publisher. Others may have been purchased or checked out from the library. I am willing to receive copies of appropriate books from publishers for review on this blog. Please contact me for further information.